MIAMI, FL (March 23, 2011) – Latino parenting blogs PapiBlogger, Mamá Contemporánea and Momma Findings are issuing a “national call for gift ideas” for the 2011 Mother’s Day Gift Guide. The attractive, fully bilingual digital guide will be published and distributed nationally two weeks before Mother’s Day. The deadline to submit gift ideas for this special shopping guide is April 18. The Mother’s Day Guide is the second major collaboration by the parenting blog team of PapiBlogger and Mama Contemporanea. This time they are proud to be joined by one of the most influential Texas bloggers of Latina descent, Sara Patterson of Momma Findings. “Our Mother’s Day Guide offers marketers a powerful way to showcase their products to bilingual, English and Spanish-language Latinos seeking great gift ideas for mom,” said Manny Ruiz, publisher of the creative parenting site PapiBlogger and the first Latino father blogger in the nation. 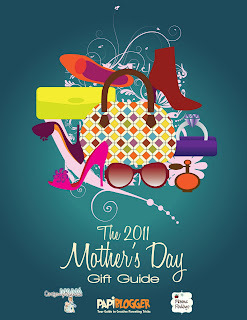 The gift guide will consist of a wide range of gift ideas for moms of all ages. Gift ideas will range from the latest and greatest luxury gifts and gadgets to baby bags and more. The bloggers will write 75 to 125-word entries for each item that makes it into the guide. The guide will be heavily promoted in both social and traditional media outlets through a comprehensive proprietary platform developed by PapiBlogger and Mamá Contemporánea that guarantees that participating companies’ products will receive strong visibility with Hispanic consumers leading up to Mother’s Day. Companies and/or their public relations firms can submit their gift ideas by emailing momguide@papiblogger.com. PapiBlogger, Mamá Contemporánea and Momma Findings will share all gift ideas accepted for inclusion in the guide. Companies who wish to sponsor the guide will receive enhanced opportunities for major TV visibility and public relations visibility. Potential sponsors are urged to contact PapiBlogger via email manny@papiblogger.com or by phone 305.321.5002. PapiBlogger.com is the nation’s first bilingual web site devoted to creative parenting tricks for fathers and mothers and also the first parenting web site published by a father of Latino descent. Together with its Facebook fan page www.Facebook.com/papiblogger and its Twitter page www.Twitter.com/papiblogger, the bilingual blog serves as a forum for parents to share creative parenting recipes for children ages infant to young adult. PapiBlogger is the brainchild of entrepreneur and former Hispanic PR Wire founder Manny Ruiz. The blog is part of Hispanic Media Trainers, LLC, the holding company of the Hispanic PR Blog. Manny is also the CEO of Hispanicize, the leading content platform for Hispanic social media marketers and bloggers and the organizer of the annual Hispanicize conference, the annual Hispanic PR & Social Media Conference. Mamá Contemporánea is an award-winning Spanish-language blog for trendy, upscale Latina moms focused on pregnancy, babies and toddlers. A mother of two and former television show producer, Rory Lassanke has been publishing Mamá Contemporánea out of her Dallas, Texas since 2009. Mamá Contemporánea routinely features products review, news, stories about celebrity Latina moms, eco-baby stories, beauty tips, events, fashion and much more. Momma Findings is published Latina mother of three Sara Patterson. Sara lives and breathes Social Media. Born and raised on the Texas Gulf Coast, this Southern girl has lived in big cities such as, Memphis and Charlotte, but has now gone back to her small town roots dwelling on the outskirts of Houston. A Stay-At-Home Mom to 3 children and married for 8 years, Sara stays involved with parenting communities both online and off. « En el 2007 nacieron 4,317,000 bebés!